I’m taking a little holiday from watching the news. I do this sometimes. I turn off the volume to watch all those mouths move, then let all of the frustrated and angry people float away, sealed in their lovely bubbles. Escapism? Yes – and no. Sometimes it’s the only way to imagine myself outside my own bubble of news and views, to try to see how people get sealed off from each other in their internally coherent mini-worlds. 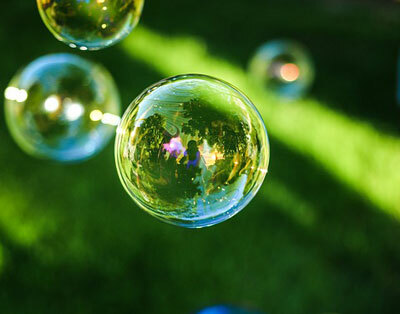 If I quiet my own rage at the world and stop myself from yelling about “truth”, I think I can see that the people inside all the bubbles are a lot alike, and are using similar ways to create their different versions of the world. It’s those ways that grab my attention for Theory of Knowledge. The following story is likely to grab your attention as well. Three reporters ran what they called an “experiment” in news consumption during the recent American election. Although in TOK we might reserve the term “experiment” for a foray into knowledge constructed more rigorously, they did gather some gripping stories of the power of filters in social media to reinforce what people believe already. As we know, in the intuitive cognitive bias known as confirmation bias, we are inclined to accept what is in harmony with our thinking and reject what jars with it, without even being conscious that we’re doing so. OK. Got it. This isn’t new. But would we expect our own biases to affect the technology you use to get access to information? Isn’t the internet neutral, just the product of an objective machine? I recommend this account of their “experiment” in Facebook bubbles, simply because one of the most effective ways of opening an issue for students is to use stories – to catch interest with human responses and then move to the larger knowledge questions. I like this particular article because it humanizes sympathetically both the people who hold left wing perspectives and the people who hold right wing perspectives. It suspends questions of who is right and who is wrong in order to look at how they are receiving their information – and how they are channeled by their initial political perspectives into self-reinforcing flows of information: “Bursting the Facebook bubble: we asked voters on the left and right to swap feeds”. This echo-chamber problem is now SO severe and SO chronic that I can only beg any friends I have who actually work for Facebook and other major social media and technology to urgently tell their leaders that to not act on this problem now is tantamount to actively supporting and funding the tearing apart of the fabric of our societies. Just because they aren’t like anarchists or terrorists – they’re not doing the tearing apart on purpose – is no excuse – the effect is the same, we’re getting countries where one half just doesn’t know anything at all about the other. Should TOK bother with bubbles? So what can we do about it? Is this a problem relevant to the Theory of Knowledge course? I’d say, most definitely, YES. an approach based on correspondence between knowledge claims and the world. The approach through correspondence may be the only way to test knowledge claims with evidence and try to get outside the bubble-effect of an approach based on internal coherence, as people within bubbles agree with each other and circulate only information that is in accord with their views. Third, TOK has to tackle the bubble-effect – of both technology and our minds — if it is to teach critical evaluation of knowledge claims at all. HOW do we take the approach of finding the best justifications – the best evidence, the best reasoning – for factual claims? HOW do we find the best justifications – the best arguments, the most thoughtful understanding – for claims of values? It’s not easy if the information most readily accessible is inaccurate, pre-selected, or heavily interpreted with emotions and values. Students need to be given awareness and taught some skills. Nevertheless, in Theory of Knowledge we are right on track to give students the awareness and the critical skills they need. As we teach how ways of knowing work, we can engage students in reflection and critique on their use and interaction, stressing how to use them critically ourselves and to recognize their critical use by others in society and in areas of knowledge. As we deal with the concept of “shared knowledge”, we can encourage them to recognize how knowledge is shared – and see the pitfalls in the flow of knowledge. I consider it essential that students gain an understanding of how we use intuition and reasoning, for instance, and how emotion affects sense perception, language and memory. It is very effective to tie the ways of knowing to recognition of common errors – common fallacies and cognitive biases. As we teach how areas of knowledge work, we are reinforcing every basic critical skill. We are introducing students to ideas of methodology – or in other words, of the expectations within each area of knowledge for the best practices and procedures of thinking critically. We are introducing ideas of conscientiously making knowledge claims that are true (to the best of our knowledge! ), being self-critical, sharing knowledge in a way that is open to group scrutiny, and being willing at least to try to break out of interpretive bubbles to understand an alternative way of thinking. In our efforts, we have the cooperation of our colleagues as they, in their own classrooms, are sharing our goals of making students understand and appreciate how knowledge is constructed. As we deal with large overview concepts of how knowledge is constructed in their areas, they are tackling the close-up applied topics of research and findings, methods and results. They are dealing, in different ways according to their fields, with topics of methodological care and responsibility. Can we encourage our students to apply some of this to their everyday google searches and consumption of social media and news? perspectives: How do we recognize, understand, and evaluate different perspectives as we consider their influence on knowledge? sources: How do we know what sources of information to accept as most reliable on particular topics? On what bases are organizations, publications, or individuals treated as expert sources? These are central knowledge questions for both areas of knowledge and everyday knowledge of the wider world. Without importing into our classrooms the strident antagonism of conflicting perspectives, can we make our students aware of the extent to which people who share a community can be living, in their minds, in mutually contradictory versions of it? Can we alert them to the need to check out the biases and bounds of their own sources of knowledge and encourage them to be sympathetic to others who, like themselves, are believing what they are told by sources they’ve accepted as reliable? I believe, to a significant extent, we can.